That we didn't see the big wave come! Miles got a big splash in the face from a wave, so we headed to a less scary place, the lazy river. Grandma Smith got Miles that snazzy car. He got all sorts of smiles and waves as he cruised along in that thing. The timeshare we stayed at had the coolest lazy river and the water was nice and warm, even if the weather was kind of funky. 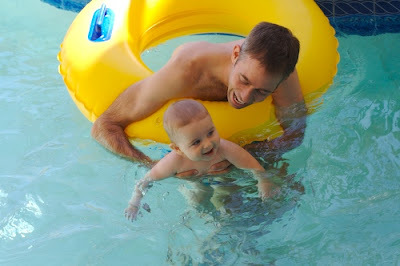 We missed so many awesome photos of Miles "swimming" like crazy with Grandpa, mommy and daddy, but we just stayed in the moment and enjoyed him. 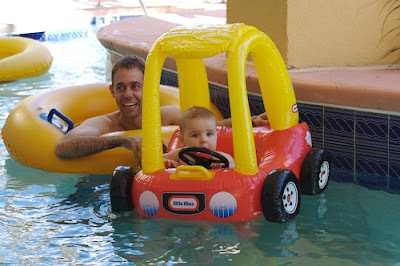 Later, after Miles went to bed that night, John and I had a blast ditching the tubes and went swimming against the current. We LOVE to swim, so that was one of the highlights of the trip. We are counting down the years that we can start taking Miles to water parks. We can't wait!